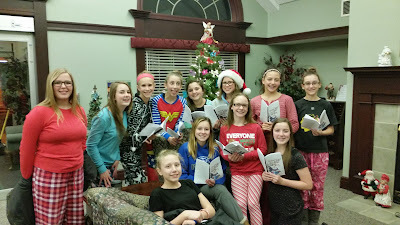 On December 21st, some of Riverview School's NJHS members brought smiles to the faces of the residents of Grande Prairie Health and Rehab Center in Pleasant Prairie. Students sang carols in their 3 dining halls and then took to a little more traditional approach and went mobile singing so that those in their rooms could enjoy their gift of song. They did an amazing job, had a lot of fun, and made the day of many of the residents at the facility. Thank you to all of the students who volunteered their time. Also, a huge thank you to Mrs. Nopenz and Mrs. Wischnowski who helped with transportation to the facility during this very busy time of year.